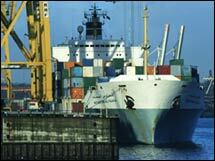 Rise in exports in April helps overcome higher oil prices, bringing in trade gap well below forecasts. NEW YORK (CNNMoney.com) -- The nation's trade deficit narrowed in April, according to a government report that showed a much smaller gap than forecasts, driven by a cutback in spending on imports by U.S. consumers. Imports outstripped exports by $58.5 billion in the month, down from the $62.4 billion in March, which was also revised lower. Record exports, and a drop in imports, helped offset higher oil prices in April to narrow the nation's trade gap. Economists surveyed by Briefing.com had forecast the gap would slip to $63.5 billion, which would have been slightly below the initial March reading. The gap narrowed despite a rise in the price of oil imports during the month. But the 8.1 percent rise in the average price of a barrel of oil to $57.28 was partly balanced by a 3 percent drop in consumption. Overall, the seasonally-adjusted value of oil imports fell by more than $1 billion. In addition, exports edged up 0.2 percent to hit a record high once again, as it has in 10 of the last 12 months. Export of services grew 0.5 percent, while export of goods was essentially flat, with food, feed and beverages being the category showing the best growth. But the real reason for the shrinking trade gap was that imports fell 1.9 percent, the sharpest drop since October. The slowdown in the U.S. economy and consumer spending, highlighted by Wal-Mart Stores (Charts, Fortune 500) reporting the worst sales comparison in its history in April, was a key driver in the lower trade gap, said Wachovia economist Jason Schenker. "Some of this looks to be the dollar in play," he said. "The weaker dollar has made imported goods more expensive, cutting consumption, while it's made our exports more competitive." The report showed that the nation's trade gap with China continued to climb to $19.4 billion, up 12 percent from March and 13 percent from year-ago levels. The imbalance between the imports and exports with China now account for about a third of the overall trade deficit, and is nearly twice the size of the trade gap with the nations that make up OPEC.